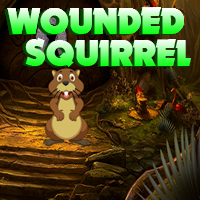 AvmGames - Avm Wounded Squirrel Escape is another point and click escape game developed by Avm Games. After travelling abroad where they had a park dedicated to squirrel, you couldn't help but love the creatures. They seemed to be gently yet playful enough. Back there, they sold biscuits that people could feed to the squirrel. Since you were already there, you tried it out. It was fun but the squirrel could get too close and clingy when they saw the food. Still, they brought excitement and laughter to your experience. You thought you'd only be able to experience a day with the squirrel there. You weren't aware that there was a different specie living in your area. It was your first time seeing it and you couldn't take your eyes away from it. It seemed like it had a different charm that what you had previously seen. Since this was new to you, you couldn't help but follow it around. You made sure to keep a safe distance. You didn't want to frightened the creature. But just a few meters away, some people made a trap which caused the wounds of the squirrel. Your heart shattered at the sight. However, you didn't want to be foolish enough to intervene. You were alone. But you just had to work smarter to help the squirrel. Good luck and have fun! I only have scenes 1-4. stuck still have clue paper with letters on it, 1 frog, 2 crabs, and 2 hearts. got the number...where is color clue for sc6? if the dots were for the eyes in s9...i bf'd that. Where do hearts go?